Last week, we had another amazing webinar with LiveRez Director of Sales and Marketing Tyler Hurst. In the webinar, Hurst discussed seven key elements of property listings that help you increase conversion and get more bookings. Also, don't forget to register for one of our upcoming industry webinars. 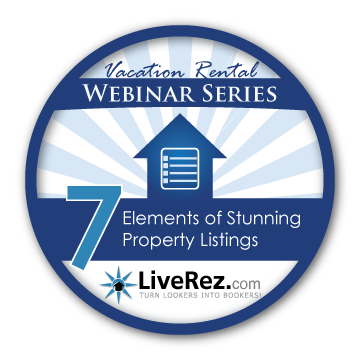 Once again, this year we'll be offering a new addition to our vacation rental webinar series every month. You can find and register for our upcoming webinars (and watch recorded ones) at LiveRez.com/webinars.